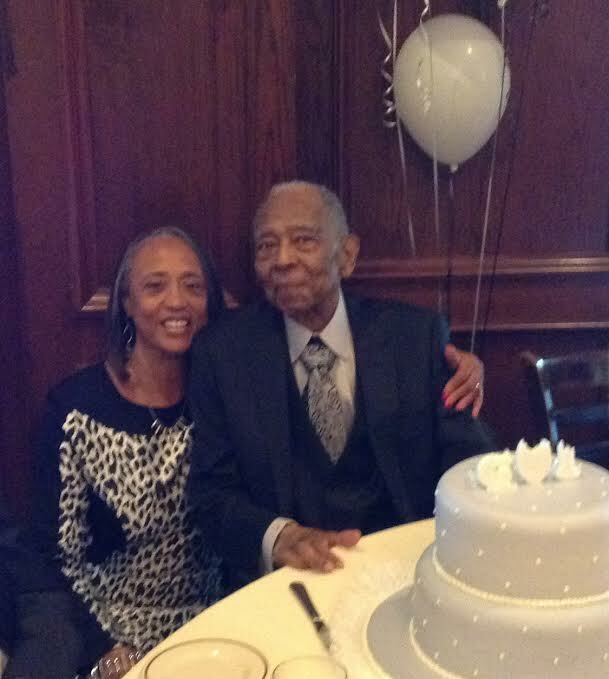 Over 100 family and friends came to celebrate the 105th birthday of Lee Wesley Gibson at Maggiano’s Italian Restaurant in Los Angeles on Thursday, May 21st, given by his three daughters, Gwendolyn Reed, Barbara Leverette and Gloria Gibson of Los Angeles. According to records at the A. Phillip Randolph Museum in Chicago, Gibson is currently the oldest living Pullman Porters. Gibson was immaculately dressed wearing a designer suit and tie, a custom white dress shirt with “105” embroidered on cuffs. The invocations was given by his pastor, Bishop Craig A. Worsham of People’s Independent Church of Christ in Los Angeles. The guests dined to a sumptuous meal, which included crabcakes, fried zucchini, pecan, apples and grapes garden salad, chicken marsala, tilipia, eggplant, spinach and mash potatoes, fresh fruit and New York cheesecake. Gibson received a congratulatory letter was received from President Barack Obama, as well as resolutions from Los Angeles Mayor Eric Garcetti, Los Angeles County Supervisor Mark Ridley Thomas, as well as, President of the Los Angeles City Council Herb Wesson, signed by all members of the council. Larry Jefferson, a close family friend, sang a soaring, acapella rendition of Happy Birthday prior to Gibson blowing out the candles on his cake. As the afternoon came to a close, Gibson’s daughters, Gloria and Gwendolyn, paid tribute to their father and thanked everyone who helped make the afternoon possible. Gibson was born on May 21, 1910 in Keatchie, Louisiana. His family moved to Marshall, Texas when he was a young boy. He later married Beatrice A. Gibson in 1927 and they moved their family to Los Angeles, California in 1936. His beloved wife passed away in 2004 after 76 of marriage. Gibson retired from Union Pacific Railroad in 1974 after serving for 38 years as a Pullman Porter. Even after retirement, he continued to live life to the fullest. He volunteered at Los Angeles International Airport assisting travelers. Gibson also managed income tax preparation offices for H&R Block. He served as District Director for AARP tax preparation assistance program for seniors. Gibson has served as church treasurer, deacon, and officer of the church credit union at People’s Independent Church, where he has been a member for over 65 years. Most recently Mr. Gibson was featured in a TV commercial for Dodge entitled “Wisdom,” which honored centenarians. It aired during the 2015 Super Bowl telecast. Gibson is in great health, taking only a daily vitamin. He enjoys going to church, spending time with family and friends, watching the Los Angeles Dodgers and attending social events. In addition to his three daughters, he is the grandfather of six, great-grandfather of nineteen, great-great-grandfather of twenty-two and the great-great-great-grandfather of three.